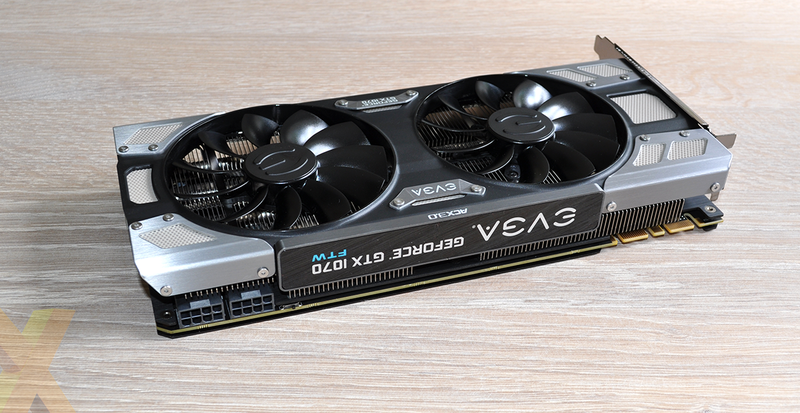 We've seen an influx of new GPUs in the past four months, with a range of GeForce and Radeon products launched in quick succession. Prices have ranged from as little as $99 for the Radeon RX 460 to as much as $1,199 for the all-singing, all-dancing GeForce GTX Titan X. 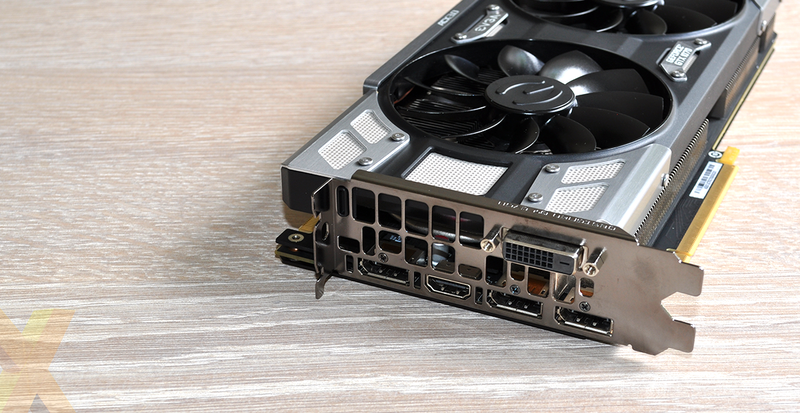 There is plenty of choice in between, and if we had to pick just one latest-generation GPU that stands out from the crowd, it may well be the GeForce GTX 1070. Prices start at around £370, and while that's a hefty price to pay for a third-rung solution, the GTX 1070 has two key attractions; it's far cheaper than the GTX 1080 and much faster than the GTX 1060 or Radeon RX 480 further down the line. 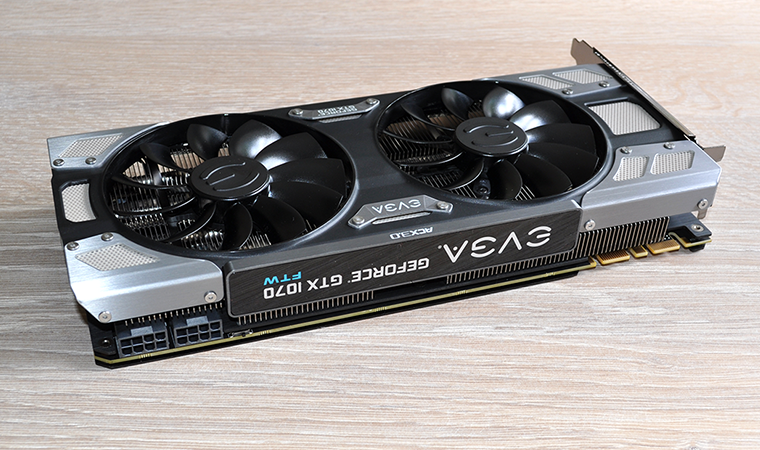 Partner cards from Palit, MSI and Asus have already been put through the HEXUS wringer, however the EVGA GeForce GTX 1070 FTW Gaming ACX 3.0 on the test bench today is arguably our pick of the bunch. 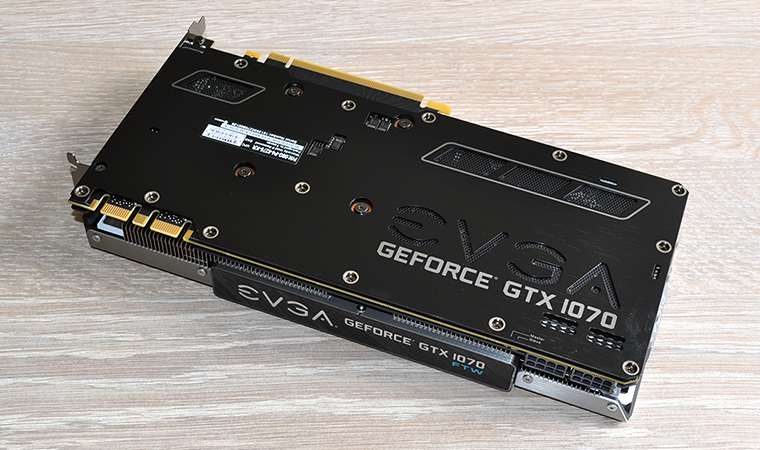 The name doesn't exactly roll off the tongue - we'll refer to it as simply the GTX 1070 FTW from here on in - but it's an almost-perfect interpretation of what a custom-cooled and overclocked GTX 1070 should offer. 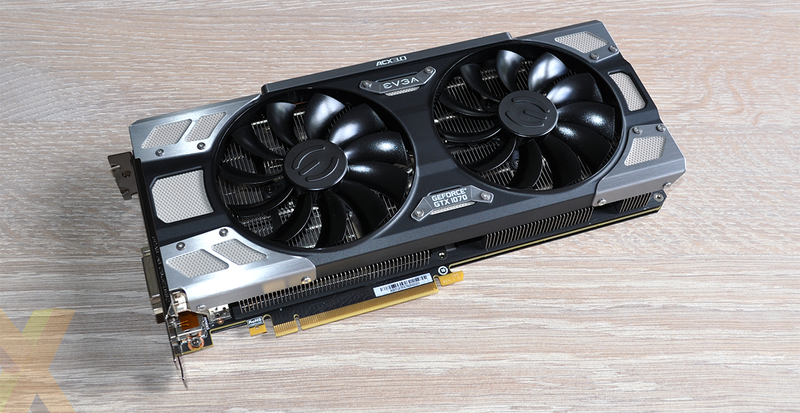 Measuring 267mm in length and 129mm in height, EVGA's dual-slot design conforms to our expectations of a high-end card and so too does the 1,088g weight. Build quality is solid throughout, with the manufacturer lining the plastic shroud with metal accents that provide excellent overall rigidity, and though aesthetics are always going to be a personal preference, I'm willing to go out on a limb and say this is the best-looking GTX 1070 I've seen thus far. It has that rare ability to appear sleek, aggressive and robust all in one go without appearing overly ostentatious. A full-size backplate has become a standard feature on most high-end cards, as has integrated LED lighting. EVGA's RGB implementation is controllable via the accompanying PrecisionX software and works particularly well. The backlit logo across the top of the card illuminates nicely and isn't too bright, while the mesh sections on the front of the card also allow light to shine through for added effect. 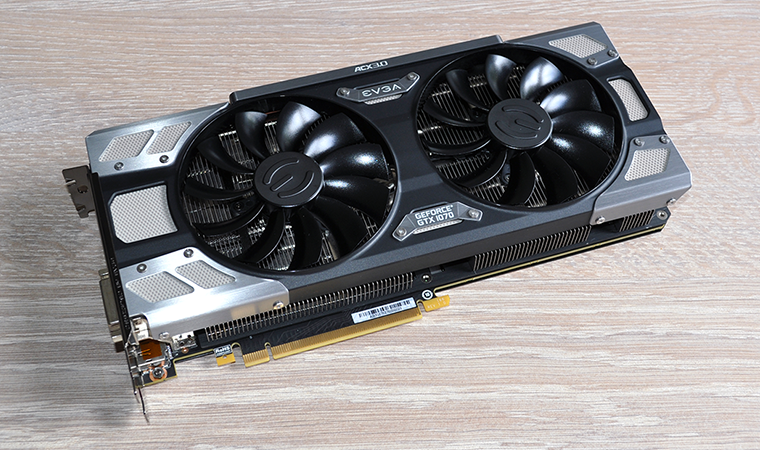 The FTW is EVGA's best air-cooled GTX 1070 to date, so it's no surprise to see a plethora of incremental upgrades. These include a pair of 8+8 power connectors, 10 power phases for the GPU - plus two for the 8GB of GDDR5 memory - as well as a dual BIOS implementation and a twin-fan, quad-heatpipe cooler that promises to be superior to the Founders Edition in just about every meaningful way. Such niceties are, of course, backed by a healthy factory overclock. Right out of the box, EVGA has the core notched up from 1,506MHz to 1,607MHz, while boost frequency is raised from 1,683MHz to 1,797MHz. The near-seven-per-cent gain is always welcome, yet EVGA has missed a trick in not overclocking the memory - it ticks along at a reference-matching 8,008MHz. Both fans switch off at low load and only feel the need to get going when temperature exceeds 60ºC, and if you're into the nitty-gritty details, you might like to know that both blowers use double ball bearings while the cooling plate that sandwiches the custom PCB is designed to lower memory and MOSFET temperature. 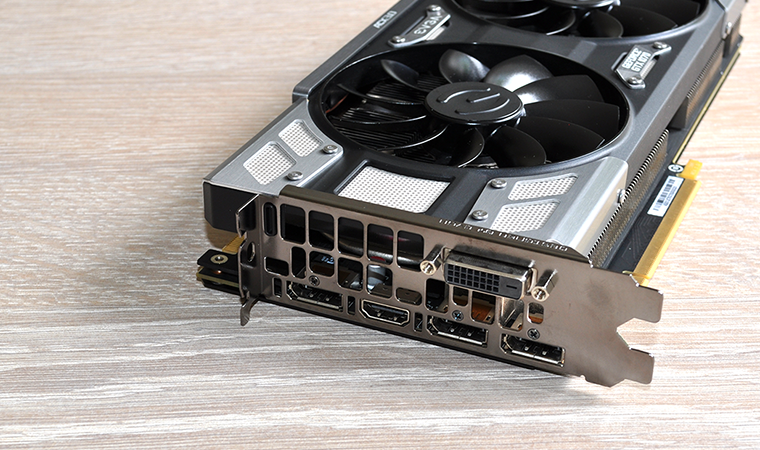 There's no change in terms of connectivity, with the FTW card maintaining Nvidia's usual roster of dual-link DVI, HDMI 2.0 and DisplayPort 1.4. 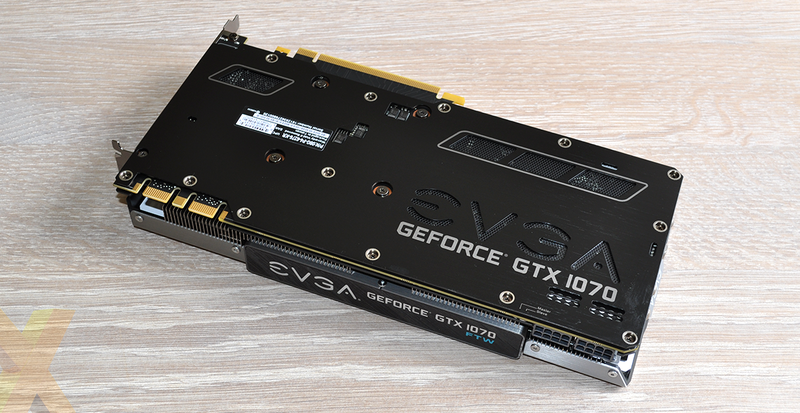 Two SLI connectors are also available for multi-card implementations, and the 'Designed by EVGA' engraving running along the edge of the I/O bracket is another stylish touch. A three-year warranty is included as standard and on the face of things, the GTX 1070 FTW has the makings of a very attractive choice. The catch? UK stores list EVGA's card at £430, representing a £60 premium over basic boards. Let's see if it's worth the extra outlay.